Thanks for all the blogiversary wishes! It really hadn’t started feeling like a year until I went digging in the archives. A single baby bootee from 50 Baby Bootees to Knit. Now, I know I (and he) will need two of these, but geez. Is it me? Is this impossibly small?? The pattern calls for Rowan Cotton Glace, but I only had Baby Ull handy. I was about to type something here about wondering if my gauge was off, but in the three seconds I took to pull these links from the manufacturer’s site made me realize, um yes. Gauge wayy off. Could stand a blocking, too. Now I wonder: Will the babe be able to wear them (a hypothetical plural) home from the hospital, even? Should I knit the other to match? Should I knit a pair larger? Heck, I wondered while knitting if I should forget the bootee and recast as socks? Advice welcome here. You know, there is nothing like seeing yourself from a new angle to realize, “Wow. That’s what huge looks like.” Don’t even ask me what I think of my ankles. Somehow I managed to post on Saturday without remembering it was my blogiversary! April 14, 2006 was the date that I made the official switch from having an online journal that was overrun with knitting to having a blog dedicated to the topic. I was nervous at first, as my journal was mostly private with only one or two people I knew well reading it. Writing for an audience was another sort of mindset, one I wasn’t sure I could handle. Jumping into the blogosphere and setting up in a corner of Knit Land was frightining since I’m not so hot at flaunting myself…or dealing with criticism. The Knitting Olympics really moved me, though, and made me realize that being a solitary knitter wasn’t all it was cracked up to be. There were festivals out there, and author talks, and spin-ins and all kinds of people who were just as into this as me–and were real people. This year has been bit of a roller coaster of blogging for me. For a while, I posted 5 days a week, then none, and now I’m just aiming for twice a week. There have been times when I’ve been utterly disgusted in my writing and others when I’ve been super proud of what I wrote (and then no one commented!). As well, there have been way too many times where I’ve wanted to give it up completely and times where I would have been lost without knowing that someone, somewhere was checking in on me. I may not have a readership of 300–or even 30–but I’ve gotten to know many of you in real life, either at festivals or through phone or off-post emails. That’s what keeps me going most days, whether I say so or not. So, thank you. First, I’d like to thank you all for the condolences on Juniper. Although we only had him for seven or eight months, he really made an impact on us. 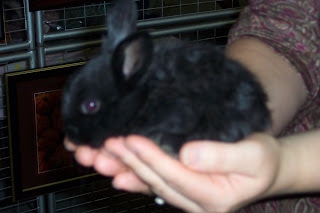 Our learning curve was huge and we struggled with how to make a bunny happy (while keeping sane, ourselves), but we never seriously considered giving him up. His last six or eight weeks were perfect; we’d struck a balance with his needs and ours and he was genuinely pleased with his life. It just didn’t seem fair. Mr. Cygknit has been my hero through all this, from taking him to the Vet posthumously to find a why (there is no good one) to cleaning and dismantling the cage so I wouldn’t come home Tuesday night to an empty one. The yarn is Plymouth Heaven, and was gifted to me by Lisa’s roomie. It isn’t something I would have selected (I’m nervous about baby yarn), but it’s really grown on me. What you see above is just a giant garter stitch rectangley thing. Stitch definition is non-existent, so why not just knitknitknit? Since my glider arrived, I’ve been looking forward to phone calls so I can rock back and forth and knit for the wee babe that will be under it some day soon(ish). Sadly, this is one of those things I can’t blame the designer–or anyone else–for. I have been wanting to try Magic Loop for ever, but always shied away from the patterns with some excuse or other. Turns out that I was right that ML can be bad for my self esteem…but upon further reflection (after flinging it to the floor) I realized that the cord length was just not enough for what I was doing. Instead of taking it (too) personally, I (finally) realized that it wasn’t the concept that was tying me up, it was the lack of cordage. Now, I just have to convince Mr. CygKnit to loan me his longer needles. Finally, I started a washrag on a whim yesterday on my lunchbreak. It has no purpose but to be a calm and mindless piece of knitting to keep me from violence at work. Hormonal? Me? Nahhh! I tried to write this post this morning, but I just couldn’t do it. Looking through the pictures on my laptop…it was just too much. 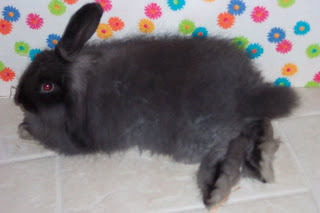 Juniperbunny got sick late last night and passed away this morning. The Vet told us this morning that there wasn’t anything they could have done for him since it took him so quickly. Thanks to emails from fellow rabbit lovers Knitter Bunny and my old friend Karen, I feel more sad than angry and guilty (which feels much more like progress than it sounds). The pictures above are ones that I’ve posted before; the ones I took a few weeks ago are still too fresh for me. He will be missed much. Waaaaaaaaay back in January I received a lovely scarf in the mail from Knitter Bunny…but I committed the ultimate blogger sin: I never mentioned it, except in passing. When she sent it to me, she asked if I could block it–she would have herself except she was afraid she’d not get to the post office if she did it. I said “Sure!” and promptly avoided blocking it. For 3 whole months. Doesn’t it look like the greyest, nastiest day out? (I’m guessing that’s why I look so thrilled.) Perfect day for a hand-knit handspun scarf. We even had snowflakes this afternoon. Notes: For the first time in my knitterly life, I used the recommended yarn. Total knitting time on this sweater was almost exactly the same as the seaming time. Regardless of what I may have inadvertently implied in my last post, the seaming time I was complaining about wasn’t related to my avoidance of it (does that make sense? ), rather I was lamenting the amazing amount of time I was putting in for something so small and easy looking. Silly me. In the pic below there’s this wee hiccup in the adding of the ribbed edging. After about 4 rip outs, I decided that this was an error I could live with. The stitch before the hiccup is about two rows below the stitch after, and nothing I tried seemed right. In fear of the consequences of continuing, I gave up. See #4. The directions (which have been complained about on various other blogs) call for a light blocking. I highly recommend a nice heavy wetting and firm block. The heck with them. When seaming with lightly spun yarn, be careful of ripping out your imperfect stitches one too many times. Why? It’s not pretty to cry in the lunchroom at work when you’re seaming the same armhole for the 4th time and the yarn breaks. Falls apart in your fingers. After you take a moment to collect yourself and convince your trembling mind that you could do this it breaks again. Too short to weave in. Yes, I cried. The thing I’m most proud of, though, is that I did all this seaming (which I know I have complained loudly about) without visual aid. Yup, I had no book or website to guide me, even though I’d been sent links. When I started I couldn’t find the book I’d used the last time I set a shoulder in, and the computer was too far away (I know, that sounds pathetic. Getting off the couch is a little tricky right now, and not at all graceful.). I ended up being amazingly particular about each freakin’ stitch, and all kinds of proud that I finished. Now, I just have 2 more to do.